No Spectators: Everyone is welcome to play, but beyond this door you must participate. 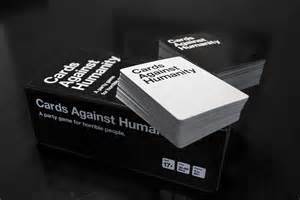 The game is played just like cards against humanity (if you don’t know how to play, someone will explain it). When it is time for the “Card Czar” to pick a winning white card they will also pick a losing white card. The person who played the losing white card loses the round, and an item of clothing. At any time you may “buy back” an item of clothing for 2 awesome points. Awesome points may be bartered but they may not be given away.